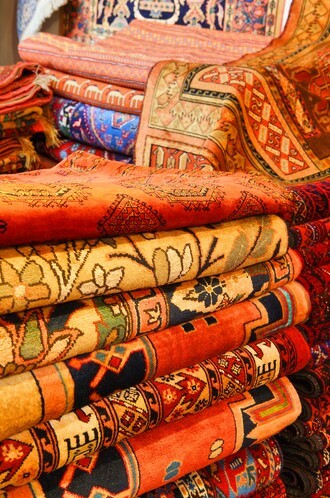 Coming soon to the Grogan & Company Gallery in Dedham, a city located on the southwest border of Boston, is the annual Antique Rug & Textile Show, where rug lovers and collectors alike will gather to show off their stunning woven pieces to the attending public. The event is typically part of an annual showing in San Francisco, which this year takes place in the city between the 15th and 18th of October, but is making a stop in the Boston area from May 29-31 for those living on the East Coast. Now in its 7th year, the ARTS event is the largest of its type and is undoubtedly the attraction of the year for Oriental rug enthusiasts and dealers living in the United States. While an informal affair, the jovial and festive atmosphere attracts hundreds every year to peruse the large offering of antique textiles and carpets, some of which are considered the most highly sought after collector’s items available in the U.S. market apart from those going to auction. The ARTS East event begins with an opening reception on May 29th at noon, and visitors are asked to RSVP ahead of time to help organizers in their preparation. The next two days, the 30th and 31st, the event will be open to the public from 10:00 am to 8:00 pm, with free entrance for guests. Visitors are also able to request a complimentary tour of the event by organizers, giving those who consider themselves Oriental rug novices an opportunity to get general information about the art of weaving as well as how to curate their own collection based on specific areas of origination or particular motifs. This year, a special exhibition will be set up by the ARTS East organizers featuring Kazak rugs, which is sure to dazzle enthusiasts. However, there will also be a wide range of other pieces on display as well, allowing anyone who has an appreciation for the uniqueness and artistry of the Oriental rug a chance to whet their palate on numerous worldwide variations. For more information on the event, visit the ARTS East website. Also, be sure to visit our showroom to view our own large collection of antique and modern Oriental and Persian rugs, or allow us to do an appraisal on a rug you already own. Additionally, we offer rug cleaning and repair services to help your precious article stay in top condition and free from harmful allergens which can collect on its surface throughout the year. Let Ahdoot’s rug experts restore your carpet to its former beauty and luster.